Hang in there.... they are worth waiting for!!!!!!!!!!!!!!!!!!!!!!!!!!!!! I WILL SEND YOU A CONFIRMATION THAT I REC'D YOUR APPLICATION. 6.If you decide NOT to keep the puppy/dog, PLEASE contact me first!! (as I might want her or him for my breeding program), but it is your responsibility to re home the puppy if it does not work out for your family.No $$$ refunds. _________________________________________________Mine is~ Dianne M. Patten (Cover) Gold & white puppy looking at you with a floral background. 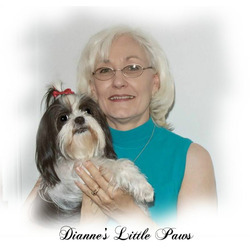 Small picture is of a puppy with a heart on the photo plus Dianne's Little Paws. ALL OF OUR DOGS ARE KEPT IN OUR HOME, NOT IN A KENNEL. THEY ARE UNDERFOOT AND LOVED TO PIECES!!!! The one & only special "Maggie Pie" 5-97 to 8-13 Sweet Sixteen !!! Always in my HEART!! !